ACURA MDX: WHAT’S NEW FOR 2019? THE A-SPEC VARIANT! Barring the addition of the fuel-saving engine idle-stop, few minor interior alterations and an all-new A-Spec trim (more about it later), the 2019 MDX remains as is. That’s because Acura revamped its three-row midsize luxury SUV a couple years ago. The retained 3.5-liter V-6 still puts out 290 horsepower @ 6200 rpm and 267 pounds-feet of torque @ 4500 rpm. And one couldn’t have a smoother nine-speed gearbox. Once again, the MDX is offered in front-wheel and all-wheel drive. Thanks to the Integrated Dynamics System (IDS), the driver can choose sport, normal and comfort settings. Looking to save fuel? The Variable Cylinder Management (VCM) system can operate in three or four cylinder modes for substantial fuel savings. Braking duties are handled competently by 12.6-inch ventilated front and 13-inch rear solid discs. Thanks to A-Spec, the even bold-appearing front fascia shows off gloss-black and dark chrome trim on the jewel-eye LED headlights, grille, window surround and rear tailgate spoiler. The cabin is awash in extravagance with red/black cooled leather seats and Alcantara inserts (also on door), sport medals, distinct A-Spec instrument gauges, thicker steering wheel, and LED fog lamps. The supersized center console bin, which is 2 inches deeper and wider and 5 inches longer, can accommodate a laptop. And the second-row seat can go fore and aft 6 inches so third-row passengers can settle in effortlessly. The huge underfloor bin in the cargo hold is a smart space saver. Passenger volume is a competitive 132.7 cubic feet. Other amenities are tri-zone auto a/c, power rear tailgate and moon roof, 14-way power driver and 12-way front-passenger seats and wood/metallic trim. Standard safety features include dual front and side airbags, side curtain airbag, driver knee airbag, four-wheel antilock brakes, front/rear crumple zones, side-impact door beams, vehicle stability assist with traction control, lane departure warning and lane-keep assist (which maintains the ride in its path), blind-spot monitor, collision mitigation system, multi-angle rearview camera, daytime running lights and tire pressure monitoring system. These also include all the safety technology that comes with AcuraWatch. 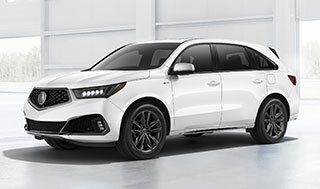 Boasting quick acceleration, the tech-savvy MDX provides well-balancing handling, decent fuel economy (despite nearly 4,300-pound weight), plentiful cargo and passenger space, and a plethora of luxury accoutrements. The A-Spec trim makes the luxury SUV even more alluring to a prospective buyer! REV-HAPPY LEXUS IS350 IS AN APPEALING RIDE! 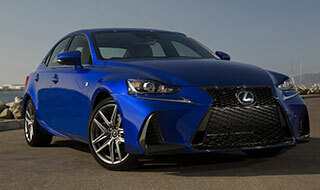 Except for a tweak or two, the third-generation Lexus IS 350 continues as is for this year. The compact sport sedan is nippy off the mark, agile in traffic and a blast to drive. How quick? It can take off 0 to 60 in barely 5.6 seconds, ¼-mile in 13.8 seconds and can reach top speed of 142 mph. Under the unitized steel body sits a 3.5-liter V-6 engine that cranks out 311 horsepower @ 6600 rpm and 277 pounds-feet of torque @ 4800 rpm. It is equipped with the IS F high-performance model’s eight-speed auto gearbox and can be driven in eco, normal or sport modes. Though our car was a rear-wheel drive, you can opt for an electronically controlled all-weather drive for firmer grip and traction. Suspension is handled by an independent double wishbone front and a multilink rear system to smoothen breaks, bumps and turns on the road. The rack-and-pinion steering with electric power assist is quick, precise and well-weighted. LED headlights and daytime running lights flank the massive spindle grille, a color-coordinated front air dam with dual chrome tips in the rear. Niceties include dual auto a/c, 60/40 rear seat, 10-way power and eight-way front-passenger heated/cooled seats, moon roof, electroluminescent Optitron gauges for the 160-mph speedometer, 7,000-rpm tachometer, fuel and coolant temperature readings, silver-metallic analog clock, and a power tilt/telescopic steering column. Trunk capacity is adequate at 13.8 cubic feet. A mouse-like, easy-to-use Remote Touch enables the driver to toggle navigation, climate, audio and phone controls, which are displayed on a 7-inch screen. Dual front and side airbags, side curtain airbag, front knee airbags, vehicle stability and traction controls, front/rear crumple zones, four-wheel antilock brakes with electronic brake distribution and brake assist, daytime running lights and a tire pressure monitoring system are standard. Add in a pre-collision system that detects pedestrians, lane departure assist and dynamic cruise control, all part of the no-cost Lexus Safety Sense+. Looking for a little bit of bunch and zest in a daily ride? Then the rev-happy and potent IS 350 will be more than happy to oblige. An extravagant cabin and respectable fuel economy should help seal the deal. The 4-cylinder gasoline engine is mated to twin electric motors (each 60 kW) and a 70kW generator, which are powered by a 12 kWh lithium-ion battery. That is adequate enough to put out a total of 197 hp while paired to a single-speed transmission. The SUV does offer a regenerative braking system for additional fuel savings. When the ride is coasting or the brakes are applied, the electric power functions as a generator, capturing kinetic energy that would normally be lost as heat through the brakes. Instead, it converts the energy into useable electricity for recharging the battery. Though a plug-in hybrid, the Outlander shows off a bold look with LED headlights and fog lamps surrounding dark chrome grille accents, front bumper silver accents and roof spoiler. The cabin is spacious with passenger volume of 101 cubic feet. The 7-inch touch navigation and display audio interface is easy to operate. The black instrument panel with silver accents conveys elegance found in high-end vehicles. Keep an eye on the rounded energy meter for fuel savings, which displays charge, eco and power readings. Several goodies are offered such as dual auto a/c, leather tilt/telescopic leather steering column and shifter, eight-way power seats, driver information center, 60/40 rear seat, power lift gate and sun roof, 710-watt Rockford-Fosgate sound system with nine speakers, under floor cargo hold, and a rear seat armrest with two cup holders. Dual front and side airbags, side curtain airbag, driver knee airbag, active stability and traction control, hill start assist, four-wheel antilock brakes, anti-theft alarm, rear camera, blind spot monitor, rear-cross traffic alert, lane change assist and lane departure warning, front-pedestrian impact crumple zones, daytime running lights and tire pressure monitoring system are standard. 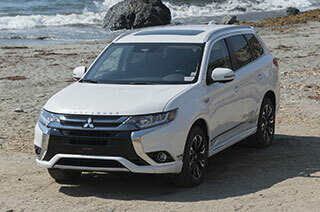 This Outlander is an excellent gas/electric/plug-in hybrid effort from Mitsubishi. It has ample power to ensure a smooth ride with good balance and handling. Besides, there is also generous cargo/passenger space though fuel mileage could be better. That it comes with a 10-year or 100,000-mile power train and a five-year or 60,000-mile new vehicle limited warranty is a plus. Lest we forget, the lithium-ion battery is also covered for 10-year/100,000 miles.